To discuss all of this, I’m joined by Dimitri Lascaris. 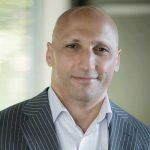 Dimitri is a partner with the Canadian law firm Siskinds, where he heads the firm’s award-winning securities class action practice. Siskinds was recently ranked the top plaintiff-side action firm in Canada. Thank you so much for joining us, Dimitri. DIMITRI LASCARIS, SECURITIES CLASS ACTIONS LAWYER IN CANADA: Always a pleasure, Sharmini. PERIES: Dimitri, give us an update on the latest developments in Greece vis-a-vis schedule of pending repayments that are coming due. LASCARIS: You may recall that several weeks ago Greece was given a very short deadline for producing a set of proposals that would potentially unleash some short-term financing from the Troika to get Greece through to the summer. 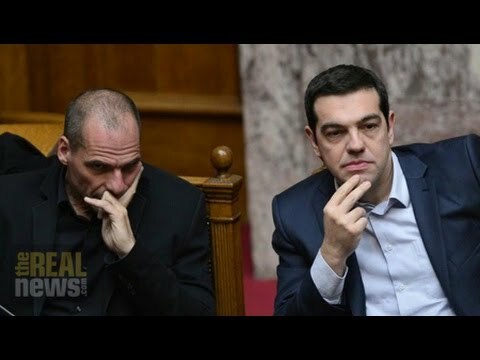 The Greek government submitted a seven-page proposal which, in many respects, appeared on the surface to be a substantial capitulation by the government of Syriza. But there was enough ambiguity within the proposals to cause consternation to the Eurogroup and the Troika. And so since then, two things have happened. The one is that the Eurogroup and the Troika have not loosened the purse strings and alleviated the banking crisis in Greece. The Greek banking system is hanging by a thread, and could collapse basically within a matter of weeks, if not days. The other thing that happened as the result of the perceived ambiguity in these proposals is that more detail and more commitment, more concrete action was demanded by the Troika, and Greece was given until this Monday to give a much more detailed set of proposals. Interestingly, for the first time as far as I can tell, this set of proposals was accompanied by a threat by the Greek government that it would default if the Troika was not reasonable. I think it’s fair to say that the government signaled it was prepared to engage in even more compromise, but that there was a line that it would draw beyond which default became inevitable. So that’s where we currently stand. I’m not aware of any concrete development since the submission of those proposals. From my perspective it’s been unusually silent, the powers that be within the Eurozone, and I think potentially and I think potentially this threat has caused some reflection. So we’ll have to see what comes out in the days ahead, but as I’ve said before, and I think this remains to be the case, Greece is potentially going to run out of money, the Greek government, within a matter of days, if further funding from an external source is not provided. PERIES: Dimitri, some financial analysts are blaming Greece for the looming financial crisis, a cloud over Europe. Some even blame it for the declining Euro, which is almost on par with the U.S. dollar at the moment. Your thoughts on that? LASCARIS: I think at this stage this is a rather modest contributor to the decline, a very dramatic decline in the Euro relative to certain currencies, and particularly the U.S. dollar. What is really driving the decline in the Euro is the program of quantitative easing that was announced by the ECB and Mario Draghi in late January, early February. The ECB has committed to purchasing some 50 billion Euros of financial assets within the Eurozone for a number of months to come, and as a result of that, the Euro has become massively less valuable vis-a-vis the U.S. dollar. I think the market, rightly or wrongly, continues to perceive that a default by Greece is unlikely, and even if it were I think the market attaches much less importance to that than the expenditure of hundreds of billions of Euros on the purchase of financial assets by the ECB. This devaluation, by the way, has benefited extraordinarily the one country that has been most vociferously opposed to quantitative easing up until recently, and that is Germany. Germany is the export powerhouse of the Eurozone, and a cheaper Euro vis-a-vis foreign currencies makes its products even more competitive. PERIES: Dimitri, as always, thank you for joining us today. LASCARIS: My pleasure, Sharmini. Thank you.